Home ›› Анализ случая ›› Digitalisation is crucial step every FMCG business must make! Digitalisation is changing how sales are made! Digitalisation is ubiquitous. New technologies are being combined with traditional methods of how to reach out to customers. Face recognition, eye tracking, augmented reality, algorithms analysing and tracking consumer behaviour are all part now of modern day life and are be used to personalize product offers by FMCG businesses or retailers. Nevertheless, Digitalisation is still in the early stages of development in many FMCG companies. Even well-known brands are still at a crossroads of how they manage the interface with the customer. P&G for example, puts enormous effort into communicating digitally with parents concerning using nappies! Pampers “swadlers”, a new product for babies with sensitive skin, has now more than 19 million views on Youtube, since the launch of an advert presenting the cooling effects of the new baby wipes two years ago. Yet Quaker Oats still put their communication efforts into characters like Cap’n Crunch and boast that it’s the downward eye angle of 9.6 degrees that captures the eye of small children in the cereal aisle! A fact that ignores that large supermarkets do their own thing these days with merchandising, rather than allowing manufacturers to determine where they are placed! 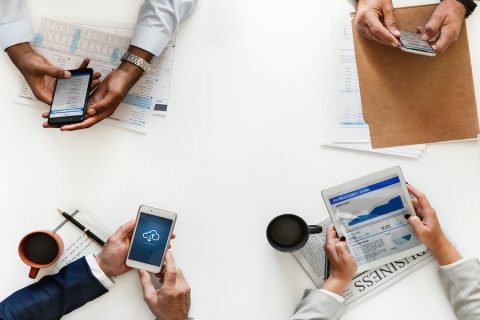 60% of interviewed sales and marketing executives in a study* by Roland Berger believe that Digitalisation of the sales and communication process will be critical to the success of their business. Top sales performers including brands and retailers around the world are using Digitalisation and they show that it results in above average sales growth and increase in sales efficiency. Millennials are the new decision makers in the market. They prefer to gather information on the internet rather than looking at a catalogue or personally interacting with sales personnel. Products or services are almost invariably first researched online, before a potential buyer makes first contact with the company. This means, in the new digital world, it is no longer enough only to develop good products! Digital visibility is the key to success. The traditional modelfollowed a “push logic”: when a new product was launched on to the market, a sales person would create the initial impulse i.e. cold calling, sending out marketing material, meetings with potential customers, personal sales presentations or a promise of large advertising campaigns are now outdated! The new modelhas a “pull logic“: the impulse is coming from the customers. They decide, when and where sales come into play and in how they want to interact. For this, information must be provided upfront and direct to the end consumer. IN B2B selling 57% of the buying decision is already completed once a sales representative is contacted for the first time. Therefore, if the brand, service or products are not represented in a digital format at this initiation stage, they are unlikely to be able to enter any short list of suppliers in the future. Dollar shave club, sold their innovative cult shaving products to Unilever for $1 billion! Craft beers like Lagunitas (now part of Heineken) are being bought up left and right by large brewers. Consumers themselves found these brands and products through forums, recommendations on social media and digital advertising! Demand has been built in a completely different way than in the past! While the contact base of an FMCG producer previously consisted of a few contact persons in the purchasing department of their important customers, nowadays, millions of consumers using similar products, or with similar needs can be reached or analysed digitally. Trust and brand loyalty analysis is easily visible by brands on Social Media at a very early stage, using this information helps make the later formal supply chain decision making process more efficient. In addition, sales personnel can benefit from customised recommendations for the customers (based on information about the online customer commentary and behaviour). New digital tools, such as apps, social media “listening pipes” and mobile functionality, enable sales and marketing teams to access consumer reactions to products and services in a very accurate and compelling way to creating strong sales pitches. In fact, in accordance to the “pull logic” it maybe the retailer that has spotted the trend and is initiating a transaction. Digitally presented information should be based on the customer journey. 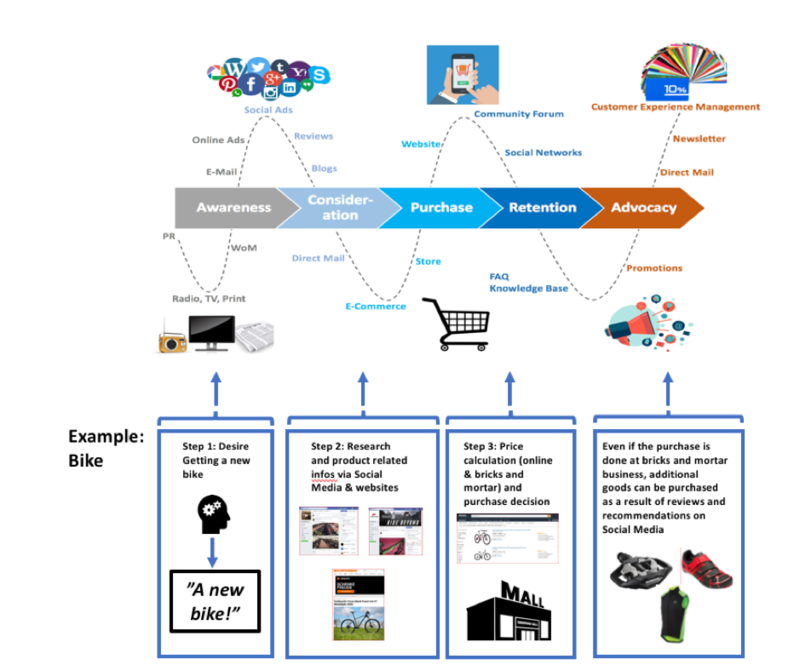 Understanding the path a potential customer takes to reach the desired target action – e.g. a purchase, order or request. There are various touchpoints with the product, the brand or the company on this journey, these can be online or offline. It is important to know what the customer expects when and where, at the various stages of the customer journey, in order for a brand to be successful. Often FRC find sales channels in FMCG companies are organised separately and not very transparent for retailers. The service packages and conditions that are offered online differ from those offered by the Key Account Manager, they are not updated regularly and they are difficult to navigate for both end consumers and supply chain professionals. End consumers expect to be able to see quickly solutions to their interests and search missions, as part of the end consumer journey, they should be able to seamlessly switch between relevant channels and should be presented a consistent brand appearance and brand message in all channels on- and offline. Supply chain professionals want to retrieve information about products and services at any time and firstly understand benefits and quickly discuss them with competent partners. FMCG businesses needs to develop an awareness of what it means, to switch from push to pull logic. When data about products and service portfolio is accessible on various channels, responsibilities of the marketing and sales team have to be redefined. The new world of sales needs a consistent IT solution and a customer relationship management system, which is equally accessible by everyone in the organisation. Digitalisation therefore always means data management centralisation and will lead to internal restructuring of the organisation. The first steps are to develop first a vision and then a strategy for the outcome of the transformation and lastly to identify the modular implementation of Digitalisation process! FMCG companies need to react now and to get started with the implementation of Digitalisation immediately! please contact our Senior Consultant Peter Harrer.